Endemic to India where it appears to be restricted to the southwesterly states of Karanataka and Kerala. In the former it has been collected from close to the city of Dandeli, Uttara Kannada (North Canara) district, the Fraserpett River, Coorg district and Korkanhalla stream, a tributary of the Tunga river at an altitiude of 652m above sea level whereas in the latter the only information we have is that it occurs in Wayanad district. It is likely to be quite well-distributed in both states however. Predominantly a riverine fish preferring clear, well-oxygenated, running water and is also found in hill streams in some areas. Aquatic vegetation tends not to grow in these kind of environments and substrates are composed mostly of boulders, bedrock and smaller stones, sometimes sand or gravel. A tank measuring 48″ x 18″ x 18″/120cm x 45cm x 45cm/255 litres should be the minimum considered to house a group of these. Choice of decor is not as critical as water quality and the amount of open swimming-space provided. However should you possess the means to both provide and decorate a sufficiently-sized tank for long term care it should really be kept in a set-up designed to resemble a flowing river with a substrate of variably-sized rocks and gravel and some large water-worn boulders. A giant rivertank manifold could even be constructed to provide naturalistic unidirectional flow. The biofilm that tends to cover the surface of rocks in this kind of display seems to be beneficial when keeping this algae grazing species. The tank can be further furnished with driftwood branches and aquatic plants for aesthetic value. While the vast majority of plant species will fail to thrive in such turbulent conditions possibilities include hardy species such as Java fern, Bolbitis or Anubias species which can be grown attached to the decor. The broad-leaved species are ideal as this fish likes to browse them for food. Like many other species that hail from running waters it is quite intolerant to the accumulation of organic wastes and requires spotless water at all times in order to thrive. It also does best if there is a high level of dissolved oxygen and a decent level of water movement in the tank. Even if a rivertank manifold is installed a large external power filter or two are going to be needed in order to provide the desired levels of oxygen, flow and surface area for bacterial colonisation. Like other members of the genus it feeds almost exclusively on small items including zooplankton, phytoplankton, aquatic invertebrates and detritus. In the aquarium it will often be seen browsing plant leaves and rocks for aufwuchs and algae or grubbing nose-down in the substrate. Food is almost never taken from the surface so it should be offered fine-grade pelleted sinking foods plus daily meals of small live or frozen foods such as bloodworm, Daphnia or Artemia. Try to use a dried product with added Spirulina or other vegetable content in order to more closely replicate its natural diet. As it tends to graze constantly offering small amounts several times a day is preferable to a single large ‘meal’. It also appreciates the presence of algae-encrusted surfaces in the tank as already mentioned. While generally a peaceable species it is robust enough to hold its own alongside quite boisterous tankmates. While smaller fish are unlikely to be preyed on similarly-sized cyprinids, characins, catfish and perhaps large clown loach are probably better choices. An Indian hill stream-themed community could be an interesting project with options including various Barilius, Devario, Botia, Garra, Nemacheilus and Schistura species amongst others. Please note that while these may make good companions for O. nashii they may not co-exist peacefully with one another in some cases so proper research is essential. Given its feeding style it should also do well alongside sand-sifting cichlids such as Geophagus or Satanoperca. Although it is gregarious by nature it is a shoaling rather than schooling species which develops a distinct pecking order and therefore should always be maintained in a group of five or more. If only two or three are purchased the subdominant fish may be bullied incessantly whereas solitary specimens can become disproportionately aggressive towards similar-looking species. Sexually mature males develop pronounced tubercules around the head area and the body takes on an overall blue (as opposed to the usual orange/brown) colouration when inbreeding condition. Females tend to be rounder in the belly, slightly less colourful and their body colour does not change during the spawning season. Not thought to have been bred in aquaria to date. This species is very scarce in the trade indeed and you’re most likely to see it on sale as a contaminant among import of other Indian species. 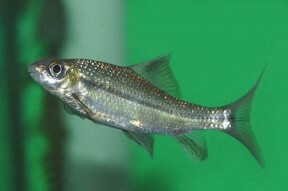 There are currently 34 described species of Osteochilus although none can be considered popular in the aquarium hobby. According to Rainboth’s ‘Fishes of the Cambodian Mekong’ members of the genus are characterised by lack of a dorsal fin spine, presence of 11-18 dorsal fin rays, large rostral and maxillary barbels, papillae on both upper and lower lips, darkened but not black median fins and the fact that the lower lip is not separated from the isthmus by a deep post-labial groove. Arunachalam, M. and M. Muralidharam. 2008 - Raffles Bull. Of Zool. 53(2): 405-414. Descriptions of a new species of the genus Psilorhynchus (Teleostei: Psilorhynchidae) from a Western Ghat stream in Southern India.